französischer Künstler (1887-1968). Autograph letter signed. New-York. 8vo. 1 p. Mit eigenh. Kuvert. 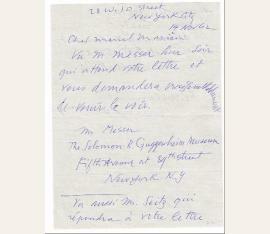 Letter to his friend and fellow artist Marcel Marien, telling him to write to two key figures of the New York museums. 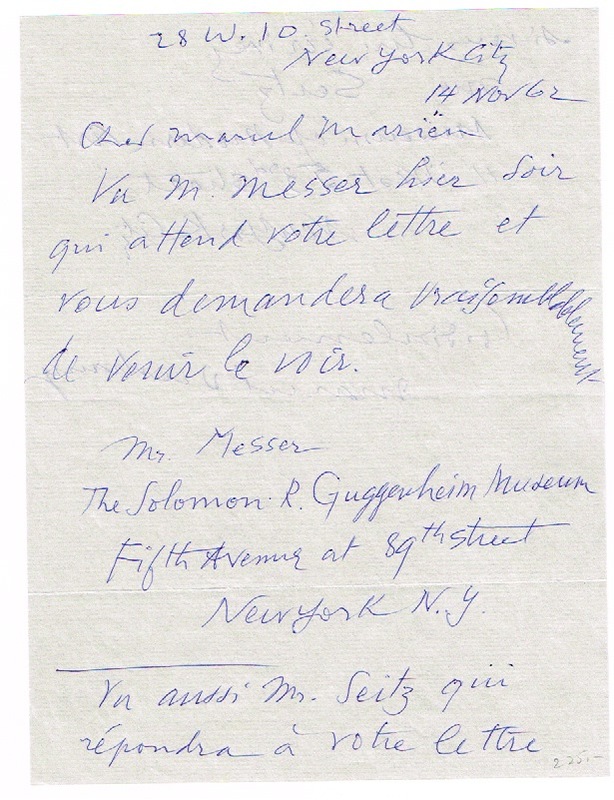 In part (translated from the French original): “Regarding Mr. Messer he awaits your letter and you will likely be asked to come and see: Mr. Messer, The Solomon R. Guggenheim Museum, Fifth Avenue at 89th Street, New York NY. 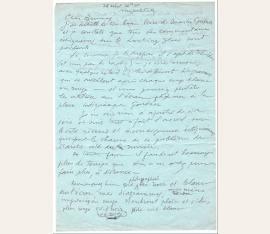 Regarding Mr. Seitz he will answer your letter if you write it: Mr. Seitz, Museum of Modern Art, 11 West 53rd street, New York City.” - In fine condition. 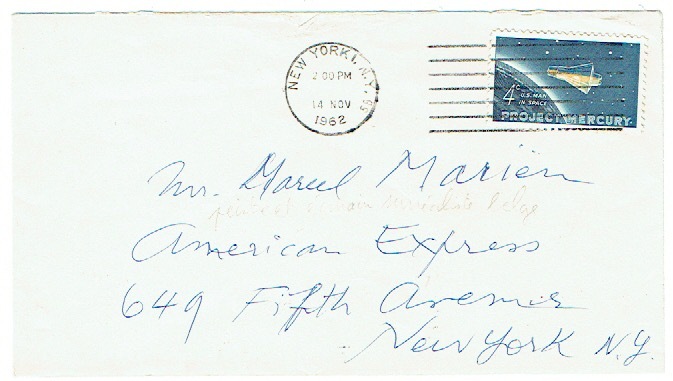 Accompanied by the original mailing envelope, addressed in Duchamp’s hand. - Marcel Marien (1920–1993) was a Belgian surrealist writer, essayist, poet, editor, but also a photographer, filmmaker, and creator of collages and unusual objects. This letter presents a number of outstanding associations in the modern art scene—Thomas Messer was the longtime director of the Guggenheim Museum, serving for 27 years from 1961 to 1988 (thus far the longest tenure of any director of the city’s major art institutions). Seitz was the curator of the Department of Painting and Sculpture Exhibitions at the Museum of Modern Art from 1960 to 1970; he was both a studio artist and historian, bridging the divide between academic criticism and the practice of studio art. He was largely responsible for raising the study of contemporary art to an academic discipline. Marien only lived in New York for a single year, and in 1963 set out for Communist China to work as a translator on the French edition of the magazine China Under Construction. A truly exquisite and historically intriguing piece connecting the movers-and-shakers of the art world during this period..
artiste français (1887-1968). Collection of five ALSs in French; all written to Jacques Brunius between 1962-1966 (with two undated); three single-paged, and two one page, both sides. In fine condition, with expected folds, and a small tear to the side of one letter. Accompanied by an New York, Cadaquès,. 7 pages sur 5 feuillets in-8 et in-4, à l'encre bleue ou noire sur papier pelure gris, bleu et crème.jointe : une lettre autographe signée de Henry Zirker (?) en français, à entête de Art of the century films, Inc. 2 pages in-4. 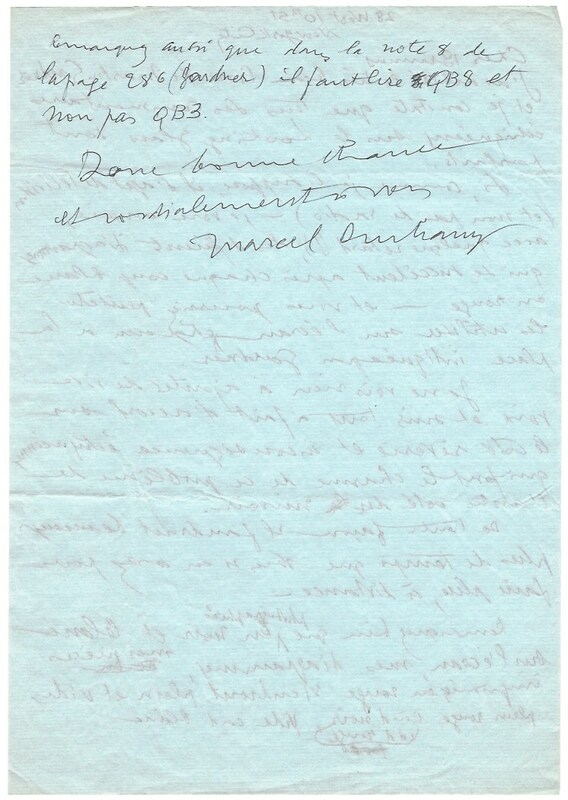 March 28, 1965, New York: “Thank you for your letter…Of course I have no information on the photo’s origin that Schwarz is talking to you about. If you have replied to him in that sense, there is nothing left but ‘to drop the matter.’ When I will see Schwarz this summer in Paris I will explain to him what I do not know. 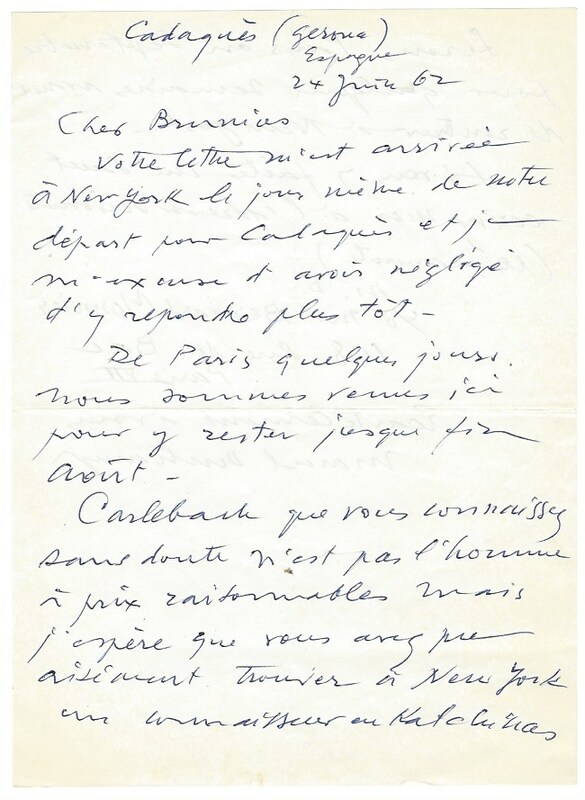 We are leaving for 5 months on April 20.” [to Neuilly s/Seine] June 24, 1962, Cadaqués (Girona, Spain): “We came here from a few days in Paris to stay until the end of August. Carlebach whom you probably know is not the man with a reasonable price but I hope that you have been able to easily find in New York an expert in Kachinas [dolls]. 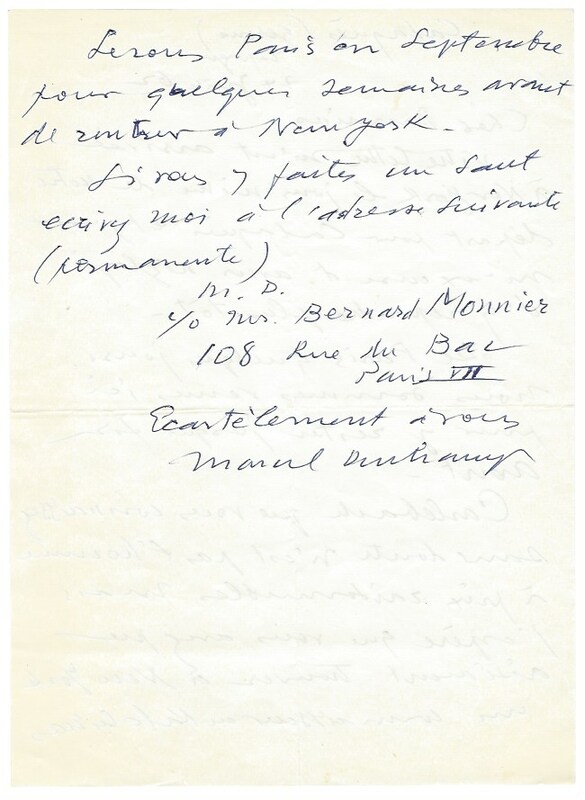 We will be in Paris in September for a few weeks before returning to New York.” January 9, 1965, New York: “I have to see Schwarz in New York on January 12 and I will pass on your scruples and my approval for publication of my letter in Minotaur. Regret that Alice is not visible—in fact I never saw the movie mentioned in Gardner. What do you think of it? If you have seen it. On Jan 14 Ekstrom has a preview of my things: ‘Less seen or not seen’—1904–1964—will send you a catalog.” Undated [but 1966], New York: “I bought the very nice book of Martin Gardner and I note that all the commentaries relating to chess on the looking glass are perfect. If it is in fact as I suspect, about television (and not radio)—I am sending you—with some delay (! ), different diagrams succeeding one another after each white or red stroke—and maybe you could use them on the screen, each to the spot indicated by Gardner. I see nothing else to add verbally and I agree completely on the dreamy aspect and inconsequent chess games making the charm of this problem on the other side of the mirror. At any rate, it would take a lot more time than you have to do more from a distance—Notice that the black and white photos on the screen, my diagrams, my pieces printed in red will come full and empty, full red which means black, red, empty which means white. Notice also that on note 8 of page 286 (Gardner) one must read QB8 and not QB3.” “Friday,” undated: “It is not possible for me to collaborate on the Minotaur for several unimportant reasons—But if the idea is fun for you, do it yourself and use it maybe (?). I do not have a minute to spare at this time. Maybe I could go to see you during its making if you let me know.” A well-known French actor, director, and writer of his day, Jacques Brunius was deeply involved in the Surrealist movement; as such, he had developed a strong working friendship with Duchamp, who had collaborated with the Surrealists from the mid-1930s on, despite his refusal to join the movement himself. While working together on the book In the Margins of French Cinema in 1954, the two found a shared passion for chess, which they later carried into Brunius’s radio show ‘Lewis Carroll: Truancy Master,’ which aired on France Culture radio on Christmas night of 1966 and was centered around a game of chess played “on the other side of the mirror.” Mistaking Brunius’s plan to be for a television show, rather than radio, Duchamp passed along diagrams to be used on screen, taken from a book by Martin Gardner, a popular writer in recreational mathematics and a longtime chess admirer. 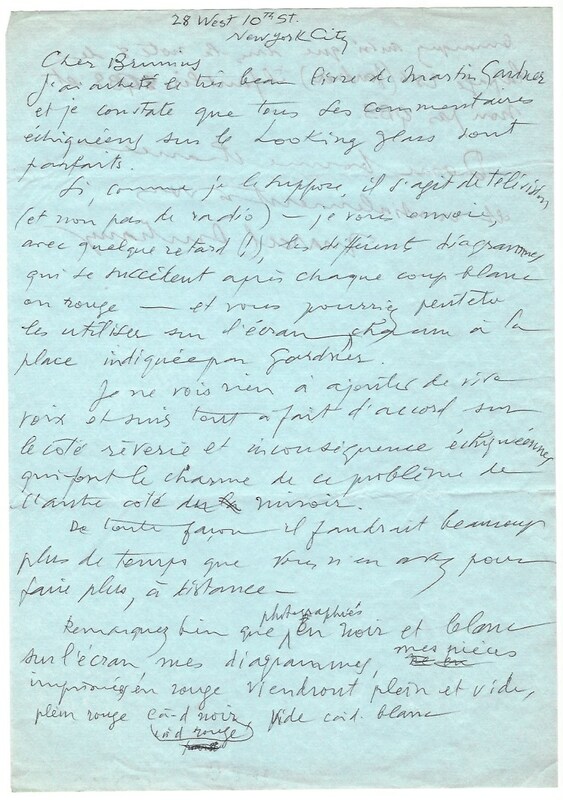 With interesting commentary on the collaborations of the two men, a mention of Cordier & Ekstrom’s 1965 retrospective of Duchamp’s work, and a refusal to collaborate on “the Minotaur” (most likely the Surrealist journal) due to “several unimportant reasons,” this is an extraordinary collection of letters from Duchamp’s later years, as his life’s work achieved the highest ranks of international celebrity.. 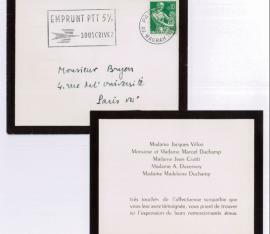 In his and his wife's name as well as in the name of Madame Jacques Villon, Madame Jean Crotti, Madame A. Duvernoy and Madame Madeleine Duchamp, and addressed to Monsieur Bryer "très touchés de l'affectueuse sympathie que vous leur avez témoignée, vous prient de trouver ici l'expression de leurs remerciements émus".